Since the opening up of India’s economy in 1991, wealth has poured into the country, and especially into Delhi. Capital bears witness to the astonishing metamorphosis of India’s capital city, charting its emergence from a rural backwater to the center of India’s new elites. No other place on earth better embodies the breakneck, radically disruptive nature of the global economy’s growth over the past twenty years. In a series of extraordinary meetings with a wide swath of the population—from Delhi’s forgotten poor to its rich tech entrepreneurs— Commonwealth Writers’ Prize winner Rana Dasgupta presents an intimate portrait of the people living, suffering, and striving for more in this tumultuous city of extremes, as well as an uncanny glimpse of our shared global future. RANA DASGUPTA is the author of Solo, which won the Commonwealth Writers’ Prize, and Tokyo Cancelled, which was shortlisted for the John Llewellyn Rhys Prize. He lives in Delhi, India. 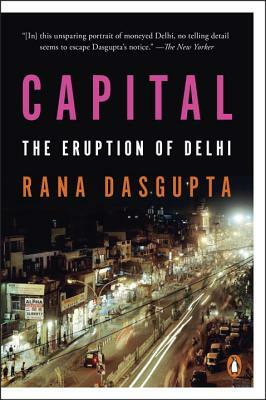 "Rana Dasgupta's Capital is a terrific portrait of Delhi right now and hits a lot of nails on the head."